Large, scented, pink, single flowers in October/November. Vigorous, upright habit. Lovely plant and wonderful service. This Camellia will bloom a bit later so I can't say anything about the flowers but the foliage is shiny and strong. Looking forwards to seing it bloom. 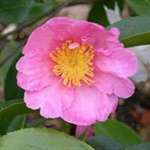 This camellia in a 4 litre pot arrived in excellent condition and was securely packaged so that none of the compost had spilled out. The compost was still moist and the foliage looked very healthy. I look forward to it flowering in the not too distant future! Superb quality plant supplied, one of the best I've ever received by post. Very well packaged too with prompt delivery.